Medieval Rumbler bell of cut, folded and hammered sheet, incomplete suspension loop. Unusually there are seven short transverse engraved lines opposite the seam. Height >34mm. Width 8.5mm. This elongated type is far less common than the normal bell made from two hemispheres. 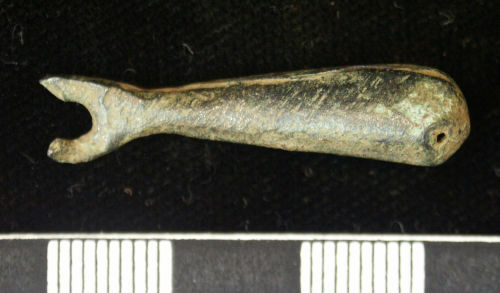 A more globular example with long neck was found at Westbury, Bucks (Ivens et al. fig. 152, no. 54).